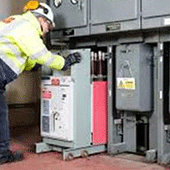 RANS Electrical offers a wide range of testing and installation for your Medium Voltage Switchboards and Circuit Breakers. 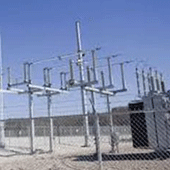 What is a Medium Voltage circuit breakers? 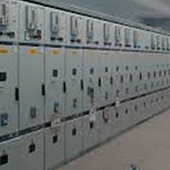 Medium Voltage circuit breakers rated between 1 and 72 kV may be assembled into metal-enclosed switchgear line ups for indoor use, or may be individual components installed outdoors in a substation. Air-break circuit breakers replaced oil-filled units for indoor applications, but are now themselves being replaced by vacuum circuit breakers (up to about 40.5 kV). Like the High Voltage circuit breakers described below, these are also operated by current sensing protective relays operated through current transformers. The characteristics of MV breakers are given by international standards such as IEC 62271. Medium Voltage circuit breakers nearly always use separate current sensors and protective relays, instead of relying on built-in thermal or magnetic overcurrent sensors. Vacuum circuit breakers—With rated current up to 6300 A, and higher for generator circuit breakers. These breakers interrupt the current by creating and extinguishing the arc in a vacuum container – aka “bottle”. Long life bellows are designed to travel the 6 to 10 mm the contacts must part. These are generally applied for voltages up to about 40,500 V, which corresponds roughly to the Medium Voltage range of power systems. Vacuum circuit breakers tend to have longer life expectancies between overhaul than do air circuit breakers. Medium Voltage circuit breakers may be connected into the circuit by bolted connections to bus bars or wires, especially in outdoor switchyards. Medium Voltage circuit breakers in switchgear line-ups are often built with draw-out construction, allowing breaker removal without disturbing power circuit connections, using a motor-operated or hand-cranked mechanism to separate the breaker from its enclosure.